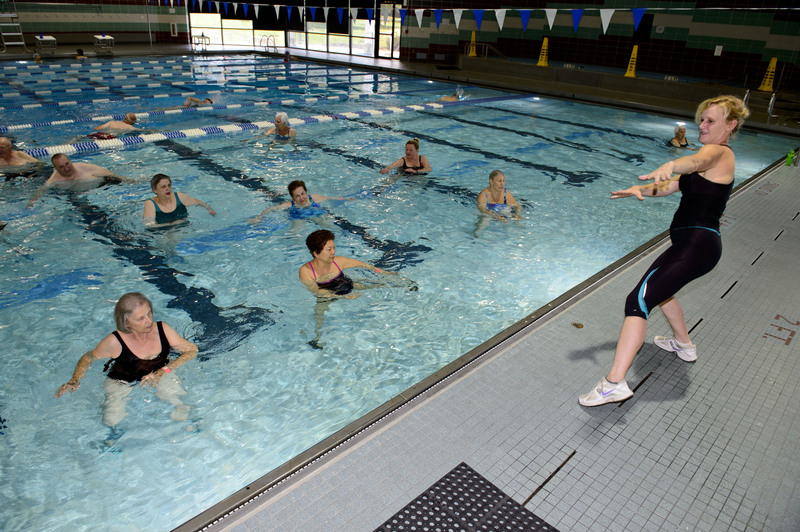 Seniors exercise and catch up with friends during a water aerobics for arthritis class at South Run RECenter. Oh, we all have our aches and pains, our pacemakers, joint replacements and health problems but they seem less significant when we are there together. Besides, none of us is particularly stunning in a bathing suit at this point in our lives anyway. Marge says to me, “Why don’t you write a story about us, George? We’re a unique group.” Indeed, I guess we are. We are the ten o’clock water aerobics arthritis class at South Run Park. Of course, far from all of us are in that class because we suffer with arthritis. I mean, when you are a senior, who wants to rush to get up and get to a class at 8 or 9 in the morning? Coffee and the newspaper are much more fun until you can get your body going, and we all agree that it takes longer and longer for that to happen. Oh, we all have our aches and pains, our pacemakers, joint replacements and health problems but they seem less significant when we are there together. Besides, none of us is particularly stunning in a bathing suit at this point in our lives anyway. The first task of the day is counting the men. Are there four or five of us today? Maybe six. Where is Joe? Haven’t seen Dave since last week. We have a new guy. One day we are going to outnumber the women. Bill, the lead counter, is 89. If only I could live to 89, I should do half as well as he. Bill is an amazing gent. He travels all over the United States visiting family, makes several annual trips to Florida on the auto train and is in a perpetually positive and humorous state of mind. There are scores of interesting folks, Anna, who talks frequently of her sick cat, and though in her 80s leaves class and invites all of us to meet her and friends at McDonalds for lunch every day, who says McDonalds appeals only to young folks? Sam, who says he is trying to overcome 45 years of inactivity, May, always with tales of the wild kindergarten grandchild and those teachers who reminisce about their experiences in the classroom. Politics is outlawed and that is good for all of us. Don’t get the idea that water aerobics is not serious business, it is. However, first we need to find out what Pete has planted in his garden, how tall the corn is, if there are any signs of tomatoes yet. How Shirley’s and Fred’s trip across the Atlantic on the Queen Mary went. Who is reading what book and will they share it when they finished and a dozen or so other equally important things. In a fifty-five minute class surely there is time for a little bit of chatter before, Carolyn, the instructor says, “If all you are going to do is talk, then move to the back corner.” All gets quickly quiet for a few moments and we attempt to follow the instructions all the while amazed at Carolyn’s energy level and how easily she can move her body in ways that most of us couldn’t even twenty years ago. She is patient with us as she yells out, “Watch your posture, stand up tall, you’re leaning.” Or our favorite, “faster, faster.” I am always certain that I am the only one that is leaning forward. But I know I am not the one going slow. After about twenty-five minutes we grab our noodles and ride them like we did our pretend ponies when we were little kids. What fun! Who can paddle without their legs touching the bottom of the pool, who touches and who cheats doing a combination of both. On occasion, we take the noodle in one hand and swing it wildly in the air making certain that as we do it splashes the water periodically so someone will complain they are getting their hair wet. Of course we stretch the noodle in every possible uncomfortable position. In the end, Carolyn wishes us well and tells us that we are finished for the day. Whew! We are tired but it is time for our reward. Out of the pool, we grab towels and rush to the hot tub to finish our conversations, relax, check on everyone’s weekend, children, and grandchildren and just soak in the warm water. It seems that we have plenty to say. We bid our farewells and then it is off to our own activities until Monday, Wednesday or Friday, whichever one is next. Thinking about us, I am reminded of the quote from Margery Williams “Velveteen Rabbit”: “When someone really loves you, then you become real. Generally by the time you are real most of your hair has been loved off, your eyes droop and you get loose in the joints. But once you are real it lasts forever.” A collection of grandmas and grandpas, we are about as real as it gets and in spite of our lack of hair and loose joints, we can always count on having a really good time. 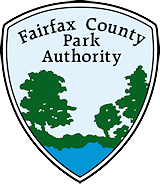 This entry was posted in Uncategorized and tagged Aquatics, Arthritis, Exercise, Fitness, Health, Parks, recreation, Seniors, South Run RECenter, Springfield, VA, Water Aerobics on June 14, 2013 by Fairfax County Park Authority.